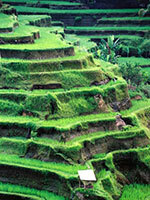 This combination tour will lead you through Balinese Temple and Green Rice terraces. Jump into the Waterfall and enjoy the taste of Coffee Luwak. Then off to Ubud for a insightful look into the local arts and crafts, which are at the core of the Balinese culture. This temple is a local Balinese Hindu temple looked after by the local residents of Batuan countryside. The temple is designed very beautifully, full of Balinese ornaments and the roof temple building is made from the fiber of chromatic black palm tree. It is a coffee, cocoa and tea plantation in Ubud – Bali. The island is apparently famous for its excellent coffee especially Coffee Luwak which is mainly produced in the Indonesian Archipelago.This coffee is made from the beans of coffee berries which have been eaten by Luwak the Asian Palm Civet (Paradoxurus hermaphroditus) and other related civets, then passed through its digestive tract. Then in their digestive tracts, fermentation occurs. The coffee beans finish the journey by passing through civets’ intestines and defecate. After that, farmers will collect the still-intact beans from the forest floor followed by cleaning, roasting and grounding process just like any other coffee. You will get a chance to learn about the fine arts and painting. 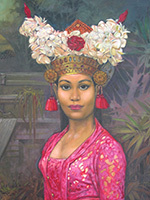 Balinese art and paintings have been classified into several groups and styles in Ubud village. 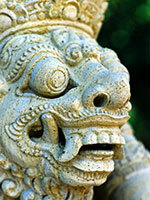 Mas Village is located in Ubud sub district and Gianyar Regency, east part of Bali. Mas Village is one of villages in Bali fundamentally identified as an artistic countryside by focusing in artistic of wood carving, here you will see how creative people making wood carving. Celuk village, the place to see patient Balinese artists make silver jewellery. This village is also renowned for its Silver Filigree and gold jewellery with special design and great quality. Tohpati village is known as the center of Batik weaving, here you will observe people make Batik painting.